Mitch is a musician of 25 years, and has developed a career as a producer and instructor over the last 10 years. After taking up guitar at the age of 11, Mitch’s passion of learning to play every record in his collection led him to form his own band, Double Zero, which made a splash in the East Coast punk scene in the late nineties. Mitch began opening tour dates for national acts The Ataris, MXPX and Ghoti Hook — all while still in high school. His non stop work ethic and dedication caught the attention of Indie labels Fat Records and Tooth & Nail Records. Shortly out of high school, he went on to form another project, Grandview, which turned the heads of A&R at Atlantic Records. The mid 2000's saw Mitch regularly touring as an opening act for The Click Five and working on a solo record with producer Ethan Mentzer (The Click Five, Mighty Mighty Bosstones) which eventually led him on a path to write, produce and play for other artists. Mitch began playing lead guitar for Dana Alexandra in 2011, working his way into bandleader / music director and catapulted her into appearing on The Voice, landed an endorsement from Taylor Guitars, and helped get Alexandra signed to a record deal with with Think Loud Entertainment. A label founded by Chad Taylor (Live). In 2012, Mitch moved to Philadelphia where he cultivated a relationship with many native artists. Among them NPR critically acclaimed rapper Kuf Knotz. Most recently, Mitch spent the better part of 2014 on tour with Rick Springfield. Mitch has currently been developing a slew of talent ranging from all ages. In Spring, 2015 Kuf Knotz released his album, "A Positive Light," featuring three tracks written produced and performed by Mitch, including the single "Elevation," on which he is also featured performing the lead vocals. 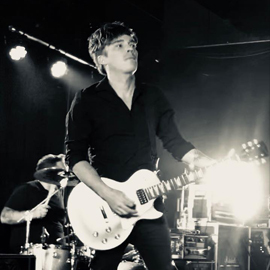 Since 2017 Mitch has produced and performed vocals and guitar on 6 additional singles from artists such as Madison Ryan, Kids Get Scared, The Black Fins and Jake Puliti. Recently Mitch has been petitioned by the Washington Redskins football team to produce and redevelop the team’s old home game theme song.